1 Cook the onion, chilli flakes and olive oil in a large saucepan over medium heat. Add the carrots and cook for a few minutes. 2 Add the carrots and cook for a few minutes. 3 Pour in the coconut milk and vegetable stock. Stir well and cook for ten minutes. 4 Add the drained chickpeas. Stir for a few more minutes. 5 Take the saucepan off the heat and blitz the soup into a purée using a food processor or blender. 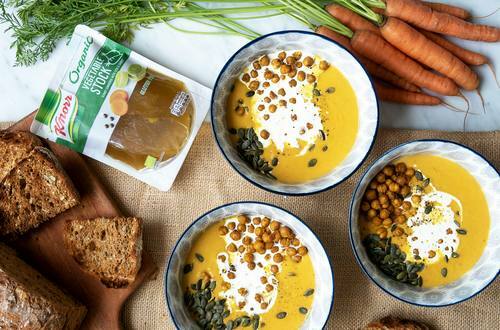 6 Serve in bowls, with a dollop of cream and garnished with pumpkin seeds and crunchy chickpeas. 7 To make the crunchy chickpeas, preheat the oven to 200°C Fan and line a tray with baking paper. 8 Put the chickpeas into a bowl and coat with the olive oil, salt, pepper and spices. 9 Spread the chickpeas out on the lined oven tray. Roast for 15-17 minutes or until the chickpeas look crunchy.